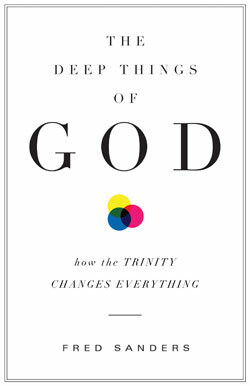 In his new book, The Deep Things of God: How the Trinity Changes Everything(Crossway, August 2010), systematic theologian Fred Sanders — an associate professor at Biola’s Torrey Honors Institute — takes a look at the doctrine of the Trinity and why it’s so important in the Christian life. On Sept. 27, Sanders will be launching his book with an event at Biola, including a panel discussion with Biola professors Erik Thoennes, Rob Price and Melissa Schubert. The event is free and begins at 7:30 p.m. in Calvary Chapel. In a nutshell, what is the doctrine of the Trinity, and why is it so important? Sanders: The doctrine of the Trinity is the Christian answer to the question, “Who is God?” It maintains a strict monotheistic commitment (Deut. 6:4-5), but it also acknowledges that Jesus Christ and the Holy Spirit are fully divine. If you think all those thoughts together at the same time, you end up with the doctrine of the Trinity: Father, Son, and Holy Spirit (Matt. 28:19) as three persons, one God. Just the fact that it is true, and that it is based squarely on God’s self-revelation in Scripture, would be enough to make it important. The only alternatives are heresies. But the doctrine of the Trinity is also important for a reason that evangelicals care about with more immediacy and urgency. That reason is that the Trinity is directly connected to the gospel. The good news is that God so loved the world that he sent his Son (John 3:16) to make us into children of God (John 1:12), and sent forth the Spirit of his Son to enable us to call him “Abba, Father” (Gal. 4:4-6). So the gospel is itself Trinitarian, and the Trinity is the gospel. You asked me to put it in a nutshell, and I tried. But it’s a big doctrine. One of the chief characteristics of the Trinity is that it is expansive, comprehensive, holistic, and mind-stretching. So it takes a big nutshell. What is “weak Trinitarianism” and what are its negative effects on evangelicalism? Sanders: In The Deep Things of God, I argue that everything about evangelicalism presupposes that life under the gospel is life in communion with the Trinity. If you forget the Trinity, you forget why we do the things we do, why we talk the way we talk, you forget all the most important bits of who we are as gospel Christians. We are what we are because of the Father, Son and Spirit. So weak Trinitarianism is Trinity-forgetfulness. A Trinity-forgetful church is one that leaves the bedrock reality of the Father, Son and Spirit unacknowledged, and tries to make its way forward without using the rich Trinitarian resources that brought it into being in the first place. The resulting condition is a sorry spectacle: Christians trying to eke out a spiritual life without availing themselves of the resources they have right there underfoot. There are two chief spiritual symptoms of Trinity-forgetfulness: First, fragmentation, with bits and pieces of the truth floating around and crashing into each other, but nothing making sense in the big picture. And second, shallowness, where everything is fine as far as it goes, but it only goes a few inches deep. In the book you write, “Evangelicals as gospel people are by definition Trinity people, whether or not they think so.” What does it mean to be “Trinity people”? What does this look like in everyday life? Sanders: On the surface, being Trinity people ought to look exactly like what any good, healthy evangelical church already looks like: prayer, Bible study, evangelism, mission, worship, life together under the lordship of Christ. Even though I claim in the subtitle that “The Trinity Changes Everything,” there’s no program here for a total makeover of the church or spiritual life. I don’t think we’re in that kind of trouble, and if we were, I don’t think theologians could fix it by writing books. At least I know I couldn’t. In this book, I’m blowing on the coals of an evangelical Trinitarianism that I think is still smoldering, and ready to burst into flame. The way the Trinity changes everything is by opening up a dimension of depth and connectedness beneath everything believers do. Evangelicals who take this book’s message to heart will keep praying, but they’ll be able to pray with the understanding that their prayer in the name of Jesus is directed to the Father and empowered by the Holy Spirit. They’ll keep reading their Bibles, but they’ll be able to do so with a heightened awareness of how the Father speaks his Word in the power of the Spirit. Prayer and Bible study could really become new things for them. But they won’t be brand new; they’ll be renewals, revivals and recognitions of what’s already there. Paul says in 1 Corinthians 2 that one of the reasons Christians receive the Holy Spirit is so that “we might understand the things freely given us by God” (1 Cor. 2:12). Notice the order there: God has given us something, and the next step is to understand it. The road to understanding it is through the Trinity: To know what God has prepared for those who love him (verse 9), we must have the mind of Christ (verse 16) and the Holy Spirit who searches all things, even the deep things of God (verse 10).